We rose before the sun on what would be our only morning in the Wahiba Sands so we could hike up the dunes in front of our camp. We wanted to catch the sun rising over the undulating formations that stretched for miles, and were not disappointed by the resulting visage. The slanted light illuminated the dunes dynamically, and morning fog could be seen bubbling out of distant vales. After we descended back to the camp, ate a breakfast buffet, packed, and prepped to check out we were treated to one of our favorite moments of the desert stay. An owl appeared suddenly on the desk in our room (no clue when or how he had entered), and we both got a few seconds to glimpse the gorgeous bird up close before it flew out of our open front door. It was perhaps a good omen for the rest of our Omani road trip, which we promptly returned to after driving out of the desert and refilling our tires in town. 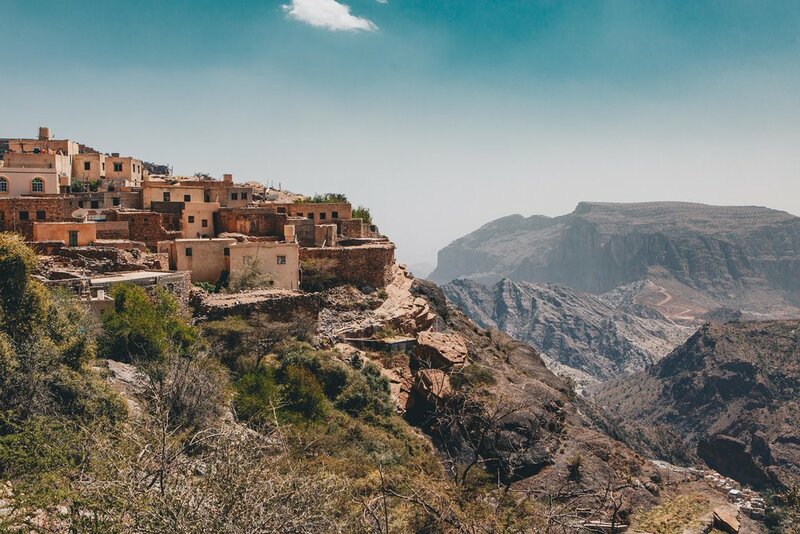 Another gem discovered in our Oman Offroad book was a moderate trek through cliffside villages in the mountainous area of Jebel Al Akhdar. The route took us through 3 scenic cliffside villages, one of them known for producing some of the highest quality rosewater in the world - and we were lucky to find that the rosebushes along our hike were in delicious bloom. This was also one of our first real encounters with functioning falaj irrigation systems. The ancient technique helps villages distribute the precious resource of water throughout terraced cliffside plots owned by various families or individuals. The resulting setting of the area is a stunning juxtaposition of large, fertile green steps suspended over a jagged, mountainous expanse.